Discussion in 'Edged Tools' started by j_d, Nov 4, 2018.
cek, americanstrat98, Jonah L. Archer and 16 others like this. Jonah L. Archer, j_d and Philly-Billy like this. Looks great, how do you mix the rope-epoxy? Any instructions would be appreciated. Jonah L. Archer, j_d and savage99nc like this. Tbe jute I picked up was actually wrapped around wire. I should have checked the package closer. I just wrapped it and pulled the bbn end under with a loop. After it was as tight as possible I massaged 2 part epoxy in until it wouldnt take any more. I then just scraped off as much as possible. After it was dry I sanded off the rough bits. If I had gotten regular jute my plan was to soak it prior to wrapping it. Easy peasy. americanstrat98, Jonah L. Archer, Bryan King and 3 others like this. Thanks, it is worth a try. Jonah L. Archer and j_d like this. I have had excellent results using 3M fiberglass repair resin for my jute wrapped projects....nice post. Pardon the dumb interruption, but what axe is that. Wetterlings Bushman. I thinned the edge just a bit but it is a good compromise for chopping/splitting in a packable size with a hardened poll and the ability to choke up. Jonah L. Archer and jasam like this. Turned out nice! I've used a similar wrap on handles to give a better grip. The wraps turned out great. I kind of like the idea of having wire in the twine. Where did you find it? Great looking piece of steel, who is the maker? I have done something similar with epoxied jute wrap. Yours looks great. I got the wrap at Lowe's. 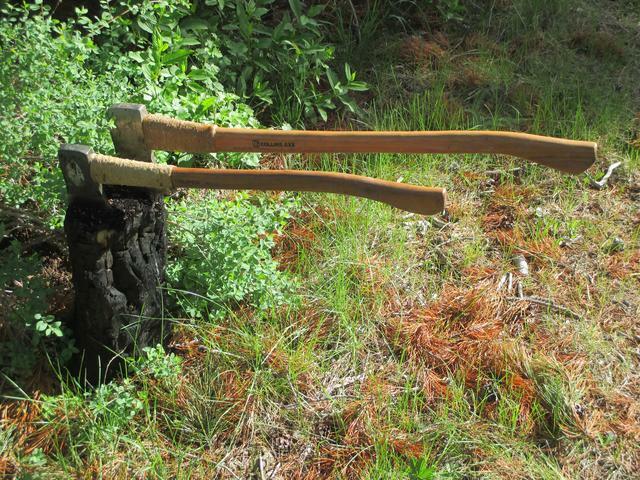 The axe is a Wetterlings Bushman. I love bbn it for a small pack axe. Jonah L. Archer and buckfynn like this. Guess using 5-min epoxy would be pushing it for the wrap then! (If you soak the jute first) Maybe 24 hr stuff will be better? which epoxy did you use? Here’s a video I saw a couple years ago. This guy jute wraps the handle were he grips it instead of at the head. Same process though. Still deciding on whether to use jute/epoxy, or paracord on my Trail Boss axe. About the only use it sees is splitting some wood for the fire pit. cek, americanstrat98, LongChinJon and 2 others like this. That would be great for grip. My main thought was for protecting the wood with over strikes but the grip is a benefit if slipping is a problem. buckfynn, americanstrat98 and Jonah L. Archer like this.